Paint some cells to black and make "shima". "Shima" means connected white cells which is surrounded by black cells or bold line. Each "shima" cannnot contain two or more number. Number shows the number of black cells touching to "shima" by the edge. Every cell containing number cannot be blackened. 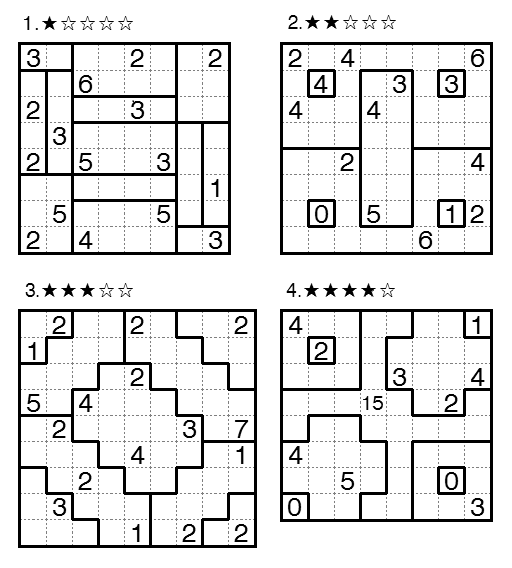 Kuromenbun is a puzzle created by Nobuyuki Sakamoto. It first appeared in nikoli #138(2012/3). "Kuromenbun" has no sense in Japanese. I think its name is combination of KURO(KURO means black) and MEN (banMEN means grid) and BUN(BUNdan means division). 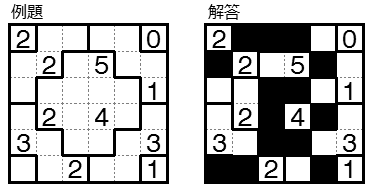 "Shima" is the term for crossword, which means white cells divided by black cells. I have two solutions for #3. One has both R5C5 and R7C6 shaded, and the other has both unshaded. Nice puzzles. This is an interesting type. Thanks. This is my favorite in nikoli #138. I think R9C7 - 2 may touch three black cells if R5C5 and R7C6 are shaded.